If you're using Google Developer tools to profile your website's performance, you might have realized that Chrome warns you about doing 'forced layouts'. In this screenshot, I marked all the warning signs chrome tries to give you so you can realize this problem. So, what does this mean ? When the browser constructs a model of the page in memory, it builds 2 trees that represent the DOM in memory. One is the DOM structure itself, and the other is a tree that represents the way the elements should be rendered on the screen. This tree needs to always stay updated, so when you change an element's css properties for example, the browser might need to update these trees in memory to make sure the next time you request a css property, the browser will know it has updated information. Why should you care about this ? Updating both these trees in memory may take some time. Although they are in memory, most pages these days have quite a big DOM so the tree will be pretty big. It also depends on which element you change, since updating different elements might mean only updating part of the tree or the whole tree in different cases. Can we avoid this ? The browser can realize that you're trying to update many elements at once, and will optimize itself so that a whole tree update won't happen after each update, but only when the browser knows it needs relevant data. In order for this to work correctly, we need to help it out a little. In this simple example, the browser will update the whole layout twice. This is because after setting the first element's width, you are asking to retrieve an element's width. When retrieving the css property, the browser know's it needs updated data, so it then goes and updates the whole DOM tree in memory. Only then, it will continue to the next line, which will soon after cause another update because of the same reasons. Now, the browser will update both properties one after the other without updating the tree. Only when asking for the width on the 7th line, it will update the DOM tree in memory, and will keep it updated for line number 8 as well. We easily saved one update. Is this a 'real' problem ? There are a few blogs out there talking about this problem, and they all seem like textbook examples of the problem. When I first read about this, I too thought it was a little far fetched and not really practical. Looking at the profiling timeline, I realized the same pattern (which was a bunch of rows alternating between 'Layout' and 'Recalculate Style'). Clicking on the marker showed that this was actually taking around ~300ms. Luckily, when clicking on the script in that dialog, it displays a JS stacktrace of the problematic call. This was really helpful, and directed me exactly to the spot. It turned out I had a piece of code that was going over a loop of elements, checking each element's height, and setting the container height according to the aggregated height. This was being set and get in each loop iteration, causing a performance hit. You can see that the 'for' loop has a call to the method 'appendItemToContainer' which sets the container's height according to the previous height - which means setting and getting in the same line. I fixed this by looping over all the item's in the container, and building an array of their height's. Then I aggregated them all together and set the container's height once. This saved many DOM tree updates, and only left one which is necessary. 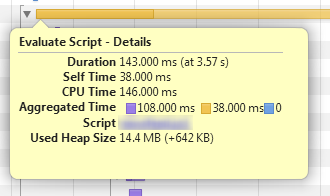 As you can see, I managed to save a little over 150ms which is great for such a simple fix!! Very good post and explanation. Helped me understand the issue around forced layout trashing. still gold a year later! thanks for the tangible example.